In a future not so far away, the Mechanism keeps the peace, augmented reality is commonplace across the solar system, and people are fitted with mandatory neural “enhancements” to make us better citizens. Africa, one of the dominant continents of the 22nd century, is home to the rich, powerful, and dysfunctional Akinya family, owners of Akinya Space, the mega asteroid mining company founded by matriarch and recluse, Eunice Akinya. When Eunice dies at 140 her adult grandchildren—Geoffrey and Summer—are launched on a quest to the ocean's depths, the Moon, Mars, and way beyond, following clues their grandmother left for them more than 60 years earlier. 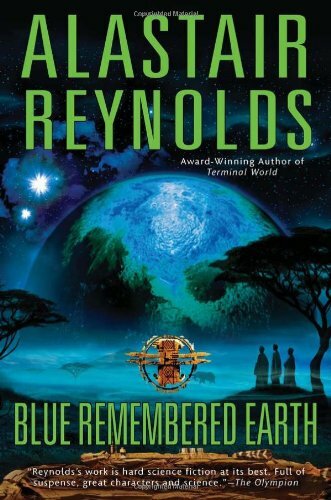 Blue Remembered Earth by Alastair Reynolds is part family saga, part space opera, and part DaVinci Code thriller. It is the first part of a “new epic” (as the blurb puts it) from this prolific and very well respected writer. Alastair Reynolds made his name with the Revelation Space novels. These were praised for the sharp writing, the rigor of the science, and the expansive ideas. Blue Remembered Earth has all of this and the series promises even more. But Alastair Reynolds' work—like so much science fiction—is often also criticized for its poor characterization and unfortunately, this new novel has this same flaw, especially in the erratic development of Geoffrey Akinya's character from morose, obsessive, spoiled brat to reasonable, responsible adult. It is a long book. Sometimes it can feel like a very long book. There are probably whole characters and associated plotlines that could have been chopped to make this a leaner, faster story. It really only seems to gather pace in the very last part of the book. For lovers of family sagas, this may not be a problem at all. For lovers of science fiction action, it could be. If the long chase from clue to clue across the solar system was intended to create a sense of excitement and tension, it failed dismally. If it was there to provide a guided tour of the inner planets, their moons, and the asteroids, it was an outstanding success. Alastair Reynolds began life as an astronomer, and it shows. His descriptions of the Moon, Mars, Mars's moon Phobos, and the techniques, technologies, and tribulations of traveling and living in space are first class. There is plenty of exposition, but it is all well done, and as Kim Stanley Robinson says, exposition belongs in science fiction, and readers expect it. If you like your science fiction realistic—“hard” in the jargon of the genre—you will appreciate the detail and the careful and informed imagining of these distant and exotic places. And you will enjoy the awe and wonder with which the author infuses every journey beyond the atmosphere of home. Blue Remembered Earth is well worth reading for the scenes on Phobos and Mars alone, but it does a solid job of building a future Earth both credible and fascinating. It is an optimistic view of that future—in itself something quite unusual in modern sci-fi. The ravages of climate change and global war are behind us when the book starts, and a new kind of society has arisen based on constant surveillance by the ubiquitous Machine and on people made less aggressive and more reasonable by their mandatory cognitive enhancements. Despite how sinister this might sound, it is all presented as benign, the only feasible way to enable peace and prosperity. And while some characters kick against it, living in the Descrutinized Zone on the Moon, most accept it and welcome it. It makes Earth a bland place in many ways, but emphasises the relative lawlessness and freedom of the rest of the Solar System. Yet if Blue Remembered Earth’s ideas and its descriptions of other worlds are its strengths, the clue chasing plot is its greatest weakness: anticlimactic, pre- telegraphed, and largely irrelevant. This is a shame, because there is a fabulous short novel inside Blue Remembered Earth, packed with vivid description and great ideas—but you'll have to wade through 500 pages to extract it.